Sam Rivers, an inexhaustibly creative saxophonist, flutist, bandleader and composer who cut his own decisive path through the jazz world, spearheading the 1970s loft scene in New York and later establishing a rugged outpost in Florida, died on Monday in Orlando, Fla. He was 88. The cause was pneumonia, his daughter Monique Rivers Williams said. With an approach to improvisation that was garrulous and uninhibited but firmly grounded in intellect and technique, Mr. Rivers was among the leading figures in the postwar jazz avant-garde. His sound on the tenor saxophone, his primary instrument, was distinctive: taut and throaty, slightly burred, dark-hued. He also had a recognizable voice on the soprano saxophone, flute and piano, and as a composer and arranger. Music ran deep in his family. His grandfather Marshall W. Taylor published one of the first hymnals for black congregations after emancipation, “A Collection of Revival Hymns and Plantation Melodies,” in 1882. His mother, the former Lillian Taylor, was a pianist and choir director, and his father, Samuel Rivers, was a gospel singer. They were on tour with the Silvertone Quintet in El Reno, Okla., when Samuel Carthorne Rivers was born, on Sept. 25, 1923. Growing up in Chicago and on the road, Mr. Rivers studied violin, piano and trombone. After his father had a debilitating accident in 1937, he moved with his mother to Little Rock, Ark., where he zeroed in on the tenor saxophone. Joining the Navy in the mid-’40s, he served for three years. Mr. Rivers enrolled in the Boston Conservatory of Music in 1947 and later transferred to Boston University, where he majored in composition and briefly took up the viola and fell into the busy Boston jazz scene. He made an important acquaintance in 1959: Tony Williams, a 13-year-old drummer who already sounded like an innovator. Together they delved into free improvisation, occasionally performing in museums alongside modernist and abstract paintings. By 1964 Mr. Williams was working with the trumpeter Miles Davis and persuaded him to hire Mr. Rivers, who was with the bluesman T-Bone Walker at the time, for a summer tour. Mr. Rivers’s blustery playing with the Miles Davis Quintet, captured on the album “Miles in Tokyo,” suggested a provocative but imperfect fit. Wayne Shorter replaced him in the fall. On a series of Blue Note recordings in the middle to late ’60s, beginning with Mr. Williams’s first album as a leader, “Life Time,” Mr. Rivers expressed his ideas more freely. He made four albums of his own for the label, the first of which — “Fuchsia Swing Song,” with Mr. Williams, the pianist Jaki Byard and the bassist Ron Carter, another Miles Davis sideman — is a landmark of experimental post-bop, with a free-flowing yet structurally sound style. “Beatrice,” a ballad from that album Mr. Rivers named after his wife, would become a jazz standard. Beatrice Rivers died in 2005. In addition to his daughter Monique, Mr. Rivers is survived by two other daughters, Cindy Johnson and Traci Tozzi; a son, Dr. Samuel Rivers III; five grandchildren; and nine great-grandchildren. Mr. Rivers pushed further toward abstraction in the late ’60s, moving to New York and working as a sideman with the uncompromising pianists Andrew Hill and Cecil Taylor. In 1970 he and his wife opened Studio Rivbea, a noncommercial performance space, in their loft on Bond Street in the East Village. It served as an avant-garde hub through the end of the decade, anchoring what would be known as the loft scene. The albums Mr. Rivers made for Impulse Records in the ’70s would further burnish his reputation in the avant-garde. After Studio Rivbea closed in 1979, Mr. Rivers continued to lead several groups, including a big band called the Rivbea Orchestra, a woodwind ensemble called Winds of Change and a virtuosic trio with the bassist Dave Holland and the drummer Barry Altschul. With the trio, Mr. Rivers often demonstrated his gift as a multi-instrumentalist, extemporizing fluidly on saxophone, piano and flute. Mr. Rivers tacked toward more mainstream sensibilities from 1987 to 1991, when he worked extensively with an early influence, the trumpeter Dizzy Gillespie. While touring through Orlando with Gillespie in 1991, Mr. Rivers met some of the skilled musicians employed by the area’s theme parks, who persuaded him to move there and revive the Rivbea Orchestra. He lived most recently in nearby Apopka, Fla. The music made by his band in the 1990s and beyond was as spirited and harmonically dense as anything in Mr. Rivers’s musical history. And the trio at its core — Mr. Rivers, the bassist Doug Mathews and the drummer Anthony Cole — also performed on its own, honing a dynamic versatility distinct from that of any other group in jazz. Mr. Rivers’s late-career renaissance was confirmed by the critical response to “Inspiration” and “Culmination,” two albums he recorded for RCA in 1998 with a New York big band assembled by the alto saxophonist Steve Coleman. In 2000, Mr. Rivers led the Orlando iteration of the Rivbea Orchestra in a concert presented by Jazz at Lincoln Center. The next year he served as the fiery eminence on “Black Stars,” an acclaimed album by the 26-year-old pianist Jason Moran. This year saw the release of “Sam Rivers and the Rivbea Orchestra — Trilogy” (Mosaic), a three-CD set featuring recordings from 2008 and 2009. 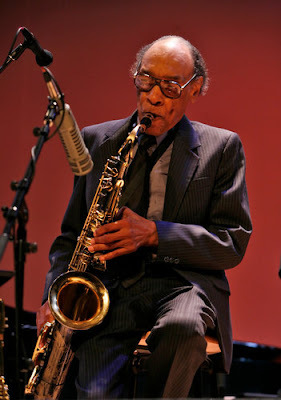 His last performance was in October in DeLand, Fla.
A version of this article appeared in print on December 28, 2011, on page A16 of the New York edition with the headline: Sam Rivers, Jazz Artist of Loft Scene, Dies at 88.